A rich tapestry of facts, rumors, secrets, mysteries, eccentric and murderous characters along with the genteel, intertwine to make up the history of Firmstone Manor and the Longdale Historic District where it is located. 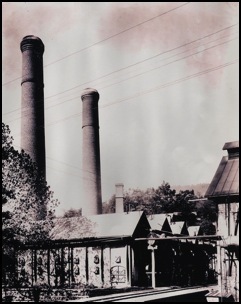 Longdale Furnace played a significant role in the development of industry in the South, the Civil War, development of the railroad and even shipbuilding. The following is just a short light introduction into its fascinating history. In 1822 Alleghany County was created (An interesting historical note declares that there is ample evidence to show that Alleghany County was to be called Pocahontas, but a clerk mixed up documents, wrote it in wrong, and the mistake stuck). In 1827 an enterprising Col. John Jordan and John Irvine erected the Lucy Selina Furnace (named after their wives) to take advantage of the rich iron ore deposits in these beautiful mountains. Lack of technical knowledge did not deter them from making this investment. Col. John Jordan also wanted to build a road over the North Mountain. 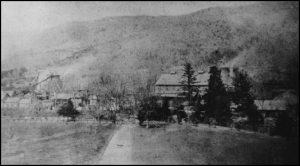 He approached Rockbridge County with the idea, requesting their help, and they knowing very well the heights and hazards of North Mountain gave him a firm “no”. However he ignored the warnings. Using slaves and prisoners he built the road. Long forgotten graves of the many men who died building this road under a cruel taskmaster line its sides and grace the top of North Mountain. Today this treacherous and seldom used road leads to some of the most beautiful views and trails in Virginia. North Mountain with the furnaces in the foreground. The Lucy Selina furnace was one of only 14 furnaces that supplied the Confederacy. It required three tons of iron ore to produce one ton of pig iron, the average daily output for the furnace. Not an efficient furnace. The only thing that made it profitable was slave labor. Most were rented for $45.00 to $60.00 per year. 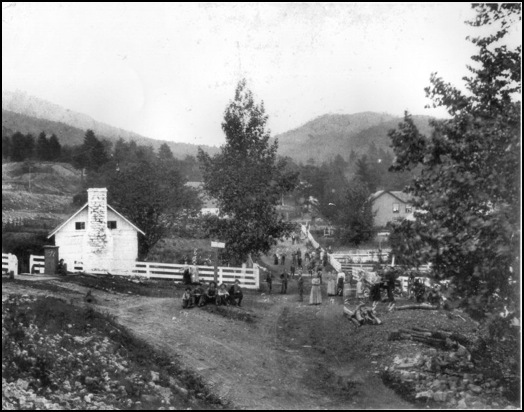 After the Civil War despondency descended upon the little hamlet. Col. Jordan in his shortsightedness did not feel the need to obtain a connection to the railroad, and without the slaves needed to run the furnaces, in 1852 operations shut down. He like many others went into financial ruin and some might say a curse fell on the family. Edwin Jordan who inherited the iron works from his father surveyed the discouraging situation and hanged himself in front of the ironworks and the two mile tree became known as the hanging tree. Martha Jordan, a 19 year old bride was found to have been buried alive. Salvation and fabulous success for the tiny hamlet arrived in 1871 with the arrival of an Englishman, Mr. William Firmstone. He purchased the Lucy Selina furnaces along with 20,000 acres and started the rebirth of Longdale by obtaining a legislative charter to build 27 miles of railroad connecting the furnaces and its mines to the existing and future C&O railroad tracks. 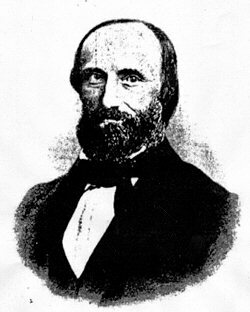 William came to America in 1835 from Shropshire England bringing with him extensive knowledge and experience of the iron industry and innovative technology. He was known as the “father of the hot blast furnace”. He started in Pennsylvania and Ohio being the first on this continent to produce pig iron from coke. He died in 1877 but his son Harry carried on the family tradition while his son Frank managed their Pennsylvania operations. Harry Firmstone made Longdale his principal home along with his close friend and manager Capt. Joseph Johnson and his wife Mary Roche Johnson. Harry frequently commuted to Pennsylvania in his private railroad car. This quiet mysterious bachelor who seemed to be more suited to creating magnificent gardens than running iron works, changed Longdale from a tiny hamlet with a couple of hundred residents to a town of 5,000. The furnaces employed 1,200 men. Homes and commercial buildings sprung up all around. There was the officer building with its huge safes. Blacksmith shop, machine shop, carpentry shop, doctors and lawyers offices, boarding house with a tennis court, laboratory, two churches one for whites and one for blacks, and the commissary which was so successful that a narrow gauge track was run right into it, so goods could be unloaded without having to carry them in from the outside. The prospect of good employment brought people from all over. Different nationalities and minorities made up the community. Besides native Americans there were Italians Irishmen, Greeks, Turks, and even Macedonians. 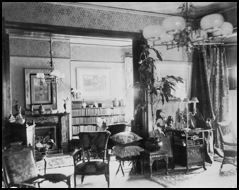 Shiploads of materials and furnishings were brought over from England to build Firmstone Manor and a home across the road for the assistant manager. The mansion had 23 rooms. 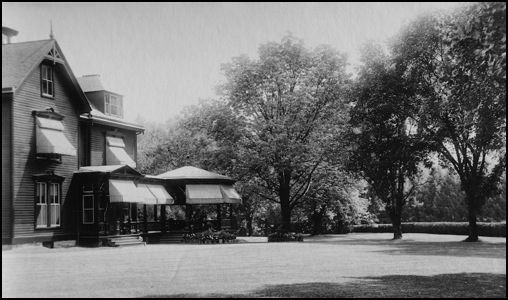 It had a carriage house, a greenhouse, gazebos, several cupolas, even a swimming pool. Flower and vegetable gardens were surrounded by acres of perfectly kept lawns. On these lawns were planted trees from all over the United States and Europe. 163 varieties were documented. 8 gardeners were employed and the mules used for cutting the lawn wore felt boots so not to leave marks on the lawns. The front of Firmstone Manor and the lawn. 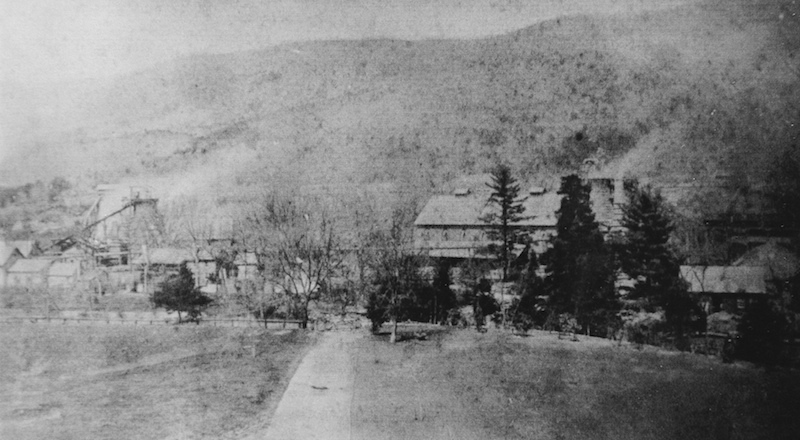 The back of the Firmstone Manor taken in the 1880s. 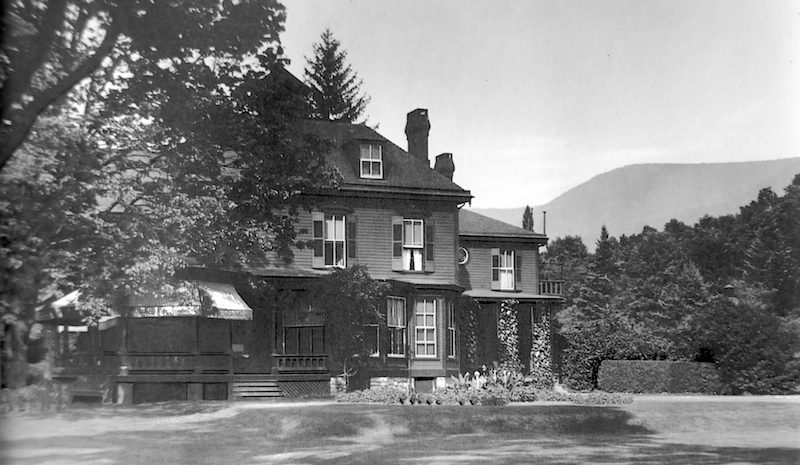 The side of the Firmstone Manor taken in the 1880s. Interior photos of the house from the 1890s. Click for larger image. Captain Johnson managed the Longdale Iron Co. and Mrs. Johnson managed the house. Besides the 8 gardeners, there was a cook, a butler, a chief housekeeper (from England) several maids, a tutor for the Johnsons two sons a Mr. Townsend who came from Pennsylvania with Mr. Firmstone. Mr. Firmstone often traveled to Pennsylvania and Ohio in his private rail car so Mrs. Johnson had her hands full and by all accounts she managed things superbly. 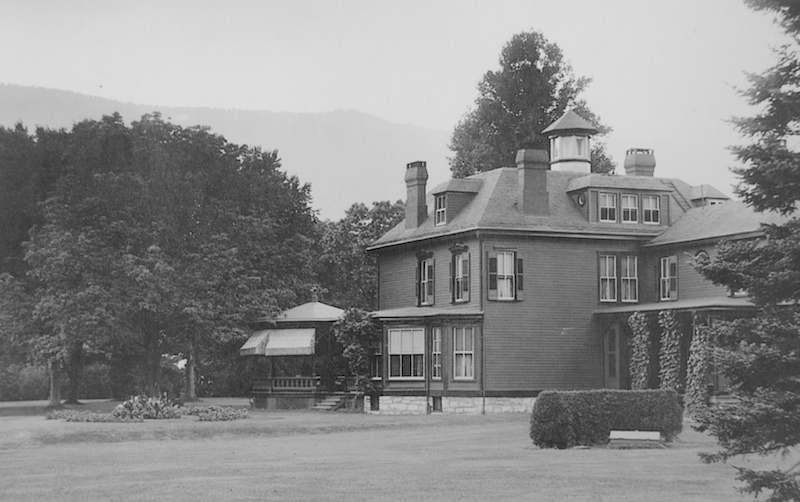 Mrs. Johnson was a gracious hostess for bachelor Firmstone, organizing parties for the towns children on the lawns, playing hostess to numerous visitors from all over the United States and England. 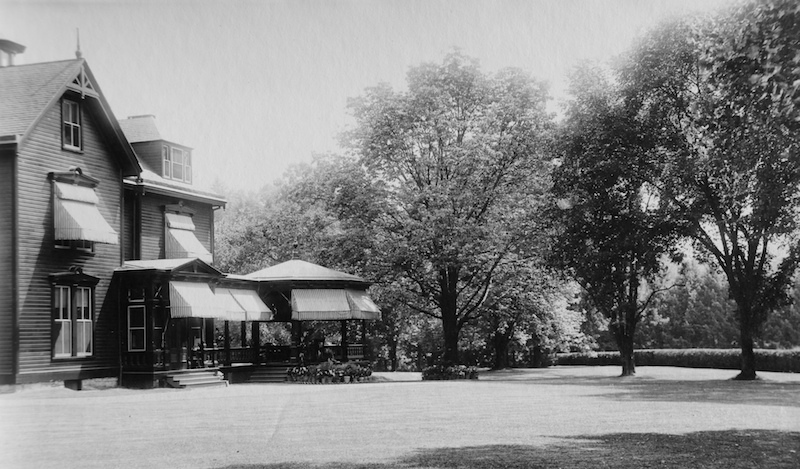 Dances and lawn parties were frequent. 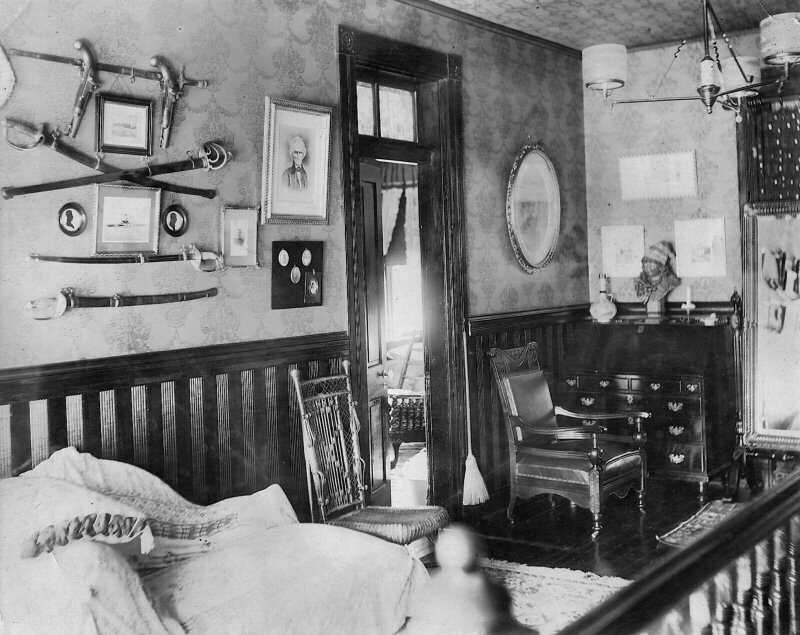 Interior of the upstairs landing at the Firmstone Manor in the 1890s. 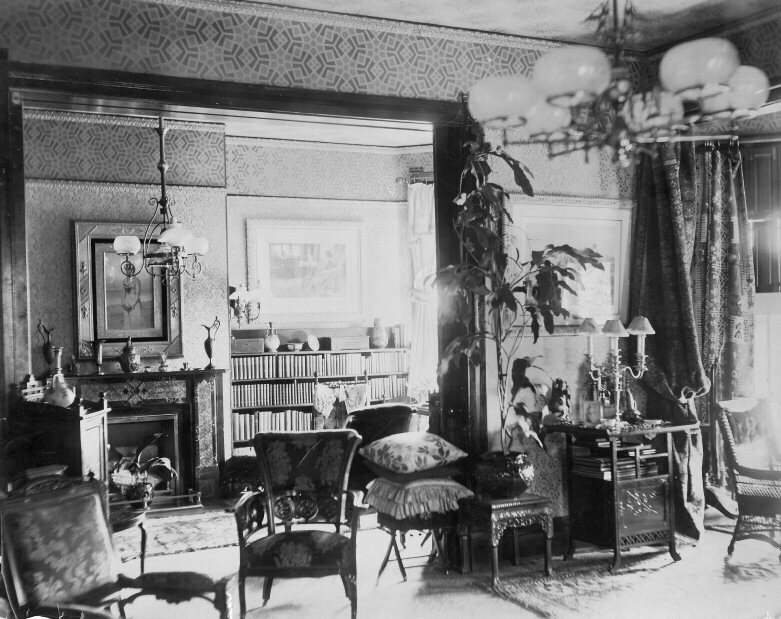 Firmstone Manor in the 1890s. The carriage house (survives to this day) was home to two automobiles. The only ones in all of Alleghany county and yet they somehow managed to run into each other. A newspaper story recounts the following: “Once one of them was coming back from town, as the other one was going out, and they ran into each other on the bridge across Simpsons Creek. One of those boys was a horrible driver. He must have hit every bridge between here and Clifton Forge,” reported the Alleghany News Gazette. For 40 years the fires never went out at the Longdale Iron Co. The furnaces worked around the clock 24 hours a day. The furnaces charged each day at 11a.m. and again at 11p.m. Even in the depression of the 1890’s when no one was buying iron and many furnaces closed, Firmstone and Johnson made the decision to keep the furnaces working. Johnson and other managers took themselves off the payroll and cut wages to 90 cents a day. ($1.50 would buy a whole weeks rations, meat, coffee, sugar, beans etc.). When prosperity returned along with the demand for pig iron, Longdale had stockpiled so much pig iron that the company did well enough to add another stack to the furnaces. The last firing of the furnaces was in 1911. All the employees and their families were invited to witness this event. They arrived dressed in their Sunday best. With reverence they gazed at the furnaces as almost 100 years of the Iron Age died. When alive the furnace was a lusty giant striding 130 miles over the mountains far into West Virginia for the coal to feed his ravenous appetite, smelting thousands of tons, clawing ore out of the slopes of Mountains. In death he is a gentle ghost and the two chimneys a monument on its grave. Firmstone died in 1922. Neither he nor his brother ever married or had children. Firmstone left the house and 430 acres along with all the buildings and the remainder of his estate to Mrs. Johnson and her sons. Mr. Johnson had preceded Firmstone in death by 10 years. Of the 20,000 acres all but 1,000 went to the Federal Government to be incorporated into the National Forest and Park System.